When fiber artist Windy Karpavage, of Taylor’s Island, shared her felted purse with Eastern Shore legislators at the recent Maryland Arts Day in Annapolis, there were “oohs” and “aahs” said around the room. Windy had been asked by Senator Addie Eckardt to showcase her fiber art to legislators to illustrate some of the amazing artwork being done by artists in Dorchester County. Windy opened Kaire ‘je Studio on Taylor’s Island in 2010. 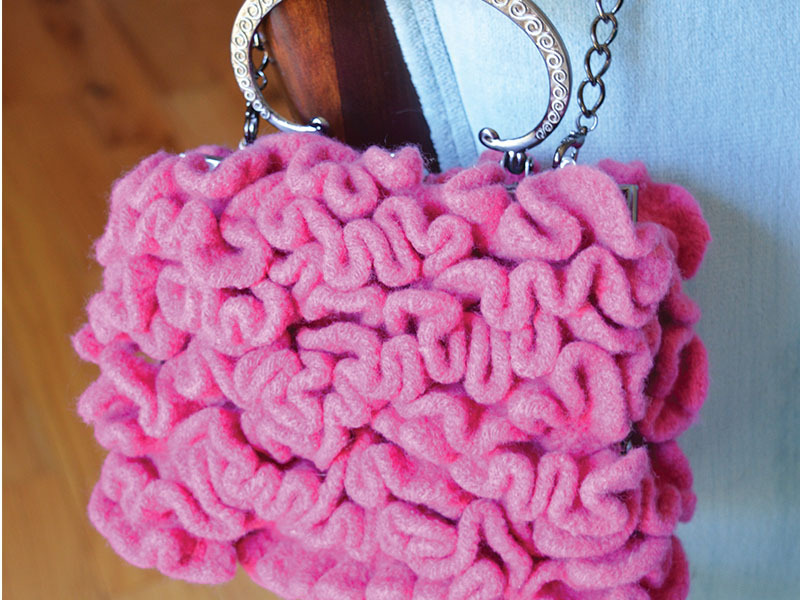 Although she had been a knitter for 20 years before opening the studio, it was not until she bought a knitting pattern to create a felted purse that she realized this might be a new business opportunity. She was first asked by the pattern’s designer, Nora Bellows, to be a test knitter for her designs. The designer then did a book on her knitted flowers and asked Windy to help her with the book, creating some of the flowers that appear in the book. Windy Karpavage, owner of Kaire ‘je Studio on Taylor’s Island in Dorchester County, is wearing one of her hand-knitted coats and holding her first felted purse, the Majolica bag. The name of her business, Kaire ‘je (pronounced Kaire jay), is the Lithuanian word for left hand. Windy is a left-handed knitter and her husband, of Lithuanian ancestry, works as a waterman on Taylor’s Island. She felt the name paid tribute to them both. 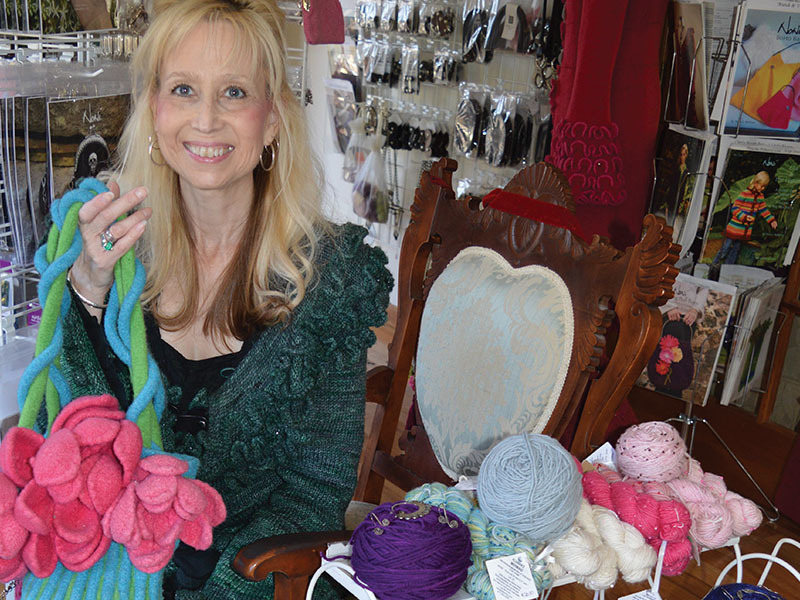 She began her business teaching knitting to both left-handed and right-handed knitters. This felted purse, created by fiber artist Windy Karpavage, can be created in one of her many fiber art classes taught at Kaire ‘je Studio on Taylor’s Island. Windy teaches knitting in both her studio and at the Dorchester Center for the Arts, where she is also the part-time financial administrator. She had previously worked in banking before starting her fiber arts business, so she enjoys the combination of job duties. She likes to say that her classes are for all levels, from the beginner knitter to the advanced. Her studio classes are mainly held on Mondays, Tuesdays and weekends on Taylor Island, and on Wednesday evenings at the Dorchester Center for the Arts. She also leads a “Fiber Friday” group at the Dorchester Center for the Arts every Friday from 10 a.m. to noon where anyone doing a fiber project can share their work, including sewing, crocheting, knitting, needlepoint, cross stitch, embroidery, crewel, and quilting. The group, which started six years ago, has grown from a few members to nearly 15 members today. She has made her niche by branding her purses with unique fibers and embellishments. The studio features patterns and kits by Rachel Donley Needlepoint Designs and Nora Bellows and patterns by Topografie and Terri Rosenthal, of Carasan Designs. She enjoys adapting these patterns to a client’s personal interest and taste. Yarn companies carried by the studio include Planet Earth Fiber, Stonehedge Fiber Mill’s Shepherd’s Wool, Dale Garn of Norway Eco Wool, Eco Fur, Baby Ull, Dale Erle, Classic Elite, Susquehanna Knitting Co. Sparkle DK, Yarn Hollow’s Tor Worsted, Universal Yarns Cotton Supreme, Skacel’s Zumie by Hikoo, Cascade Yarns Ultra Pima, Ultra Pima Fine, Heritage Silk Paints, Tangier, Anchor Bay and Cascade 220 Sport, Funky Chunky by The Third Piece, Atta Yarns, and Candy Skein Hand Dyed Yarn. She also offers HiyaHiya knitting needles. Renaissance/Blue Moon Buttons, and bag hardware and leather accessories by JUL Designs are also sold at her studio – embellishments that make her purses and garments stand out in the marketplace. Windy is a member of The National Needlework and Knitting Guild Association, as well as the Fiber Arts Council of the Eastern Shore. Kaire ‘je Studio is located at 4216 Robinson Neck Road, Taylors Island. For further information, contact Windy at 410-221-0299 or 410-330-0404 or email kaireje@yahoo.com.